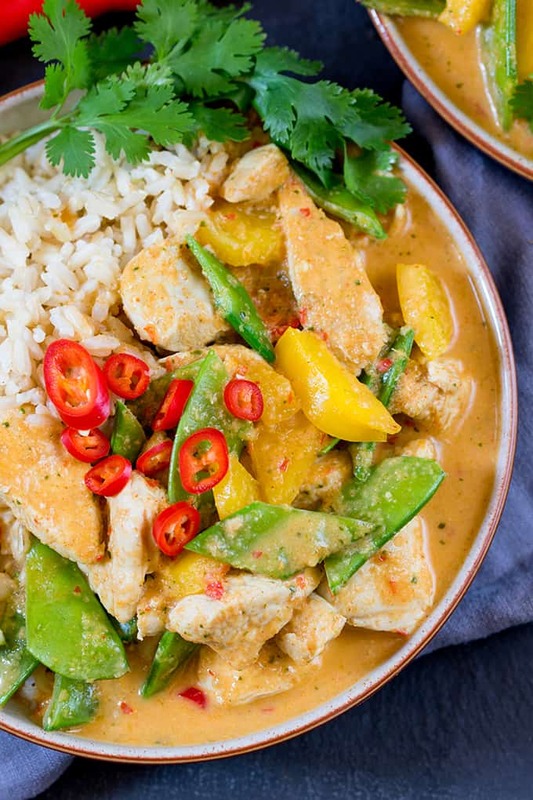 Home > Dinner > Healthier Red Thai Chicken Curry – without the shop-bought sauce! 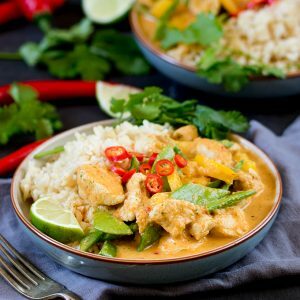 The homemade curry paste for this Spicy Healthier Red Thai Chicken Curry is easy and packed with flavour! 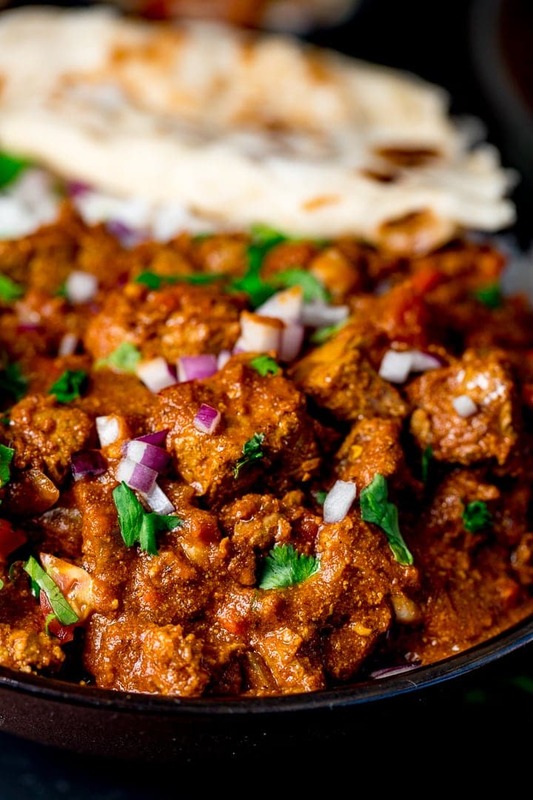 I love a good curry at the weekend. I’ll often reach for the ready-made curry paste out of convenience, but in fact it only takes 5 minutes more to make your own paste from scratch. The result is a fresher, more vibrant taste, with the added bonus that you can adjust the heat to whatever level you fancy. Nearly all of the ingredients are strong in flavour, but they meld together perfectly for a taste explosion! I’m using reduced fat coconut milk, just to help keep the fat content down a little, but you can use full fat if you prefer. 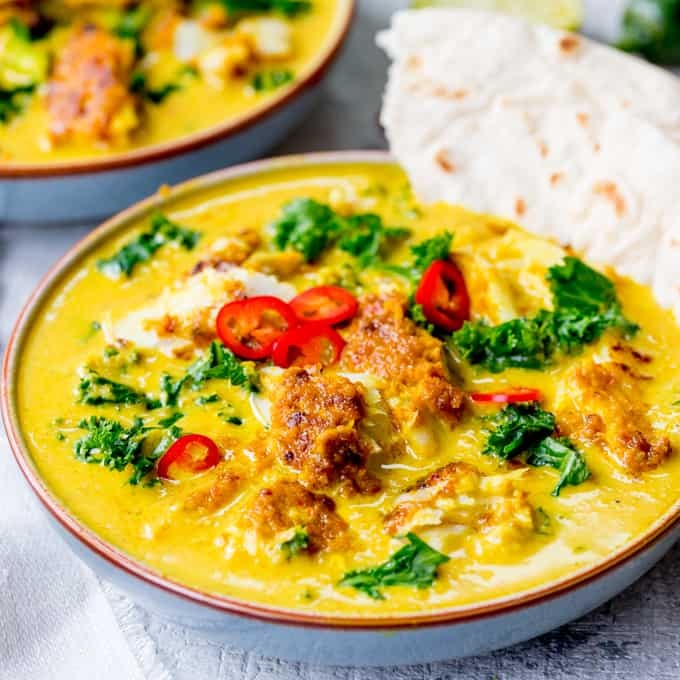 If you do use the reduced fat coconut milk, it’s important to remember not to boil the curry, as the coconut milk is likely to separate, making it look a little lumpy. Healthier food really can taste good! I’m on my last week with my personal trainer this week. I managed to lose 7 pounds over the 5 weeks, which I’m pretty happy with, as I made a special point of not starving myself (in fact that’s one of my main aims in life). I probably had a few too many cheat days – otherwise I might have got to my 10 pound target – but I’m determined to get those last 3 pounds off before Easter. 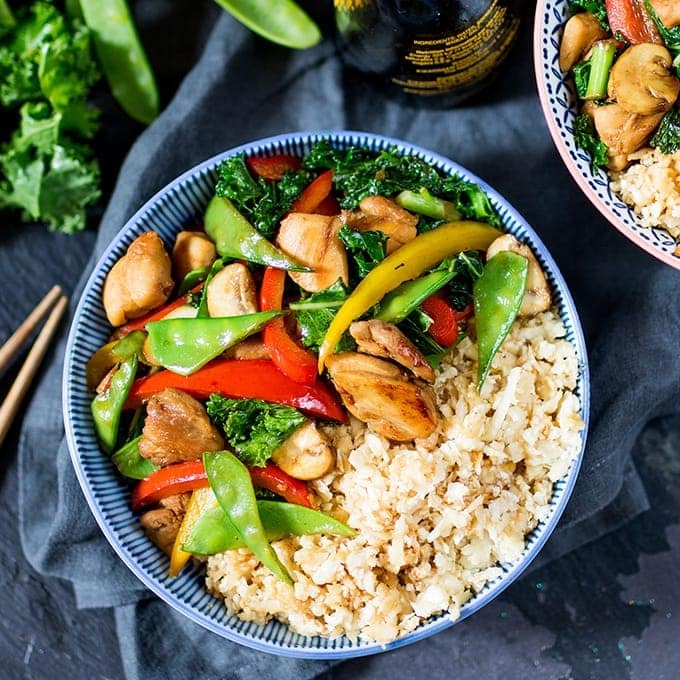 Easy dinner swaps like this have been great in helping to fill me up, without feeling deprived – you know – that feeling were you still need ‘something’ to satisfy your appetite in the evening. I hate that feeling! Add lots of veggies in to up the nutritional value. You can even serve with cauliflower rice if you’re being really good! 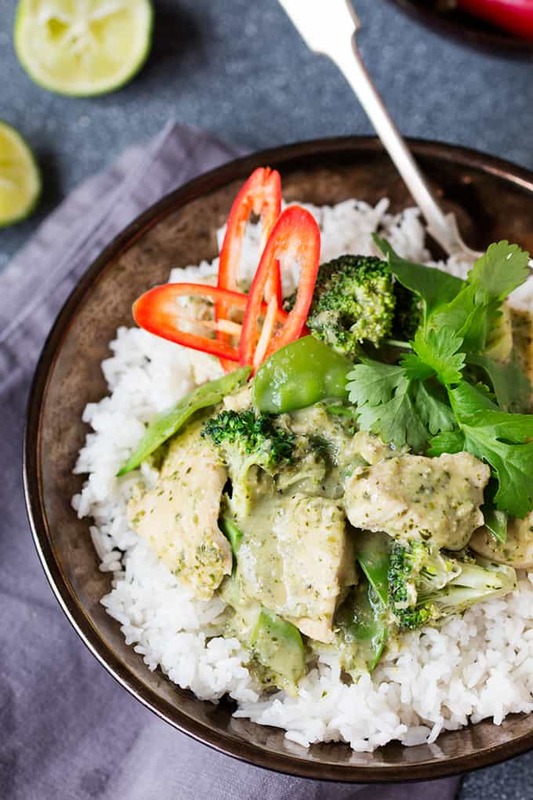 The sauciness of the curries soaks into the cauliflower rice, making it really tasty. I first made this recipe for SuperFood Magazine. 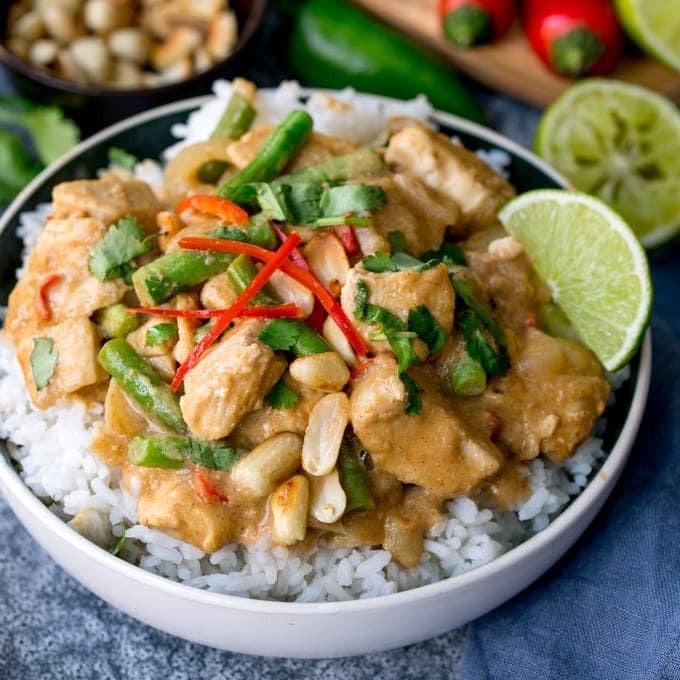 Healthier Red Thai Chicken Curry - without the shop-bought sauce! Heat the oil in a large frying pan on a medium-to-high heat. Add the chicken, and cook for 5 minutes until sealed. 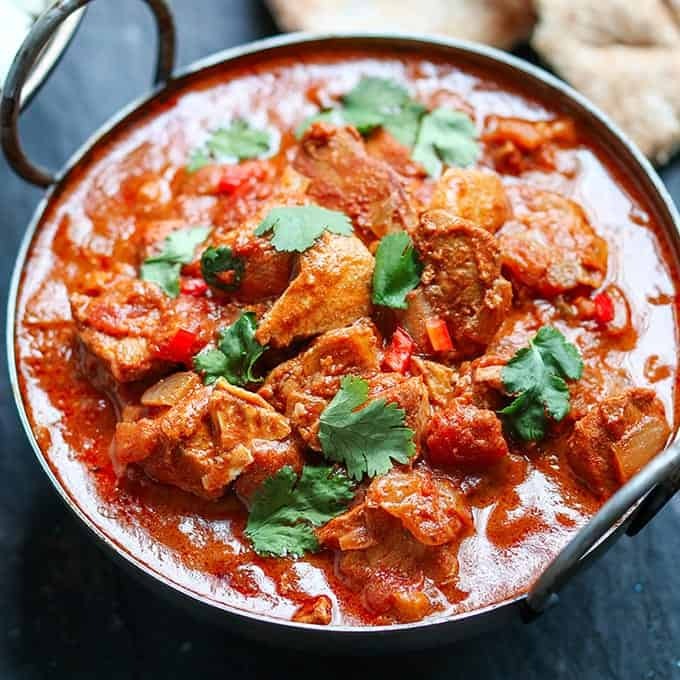 Whilst the chicken is cooking, place the red chillies, ginger, kaffir lime leaves, lemongrass, shallots, garlic, cumin, ground coriander and paprika into a food processor. Blend until the mixture forms into a paste. Add the paste to the chicken in the pan and cook for 5 minutes, stirring to coat the chicken. Add the yellow pepper, mangetout, fish sauce, lime and honey. Cook for a further 5 minutes, stirring often. By this time the chicken should be cooked through (you can check this by cutting the largest piece of chicken you can find in half and ensuring it’s no longer pink in the middle). Add the coconut milk and heat through until almost boiling. Don’t let it boil, or it may curdle. 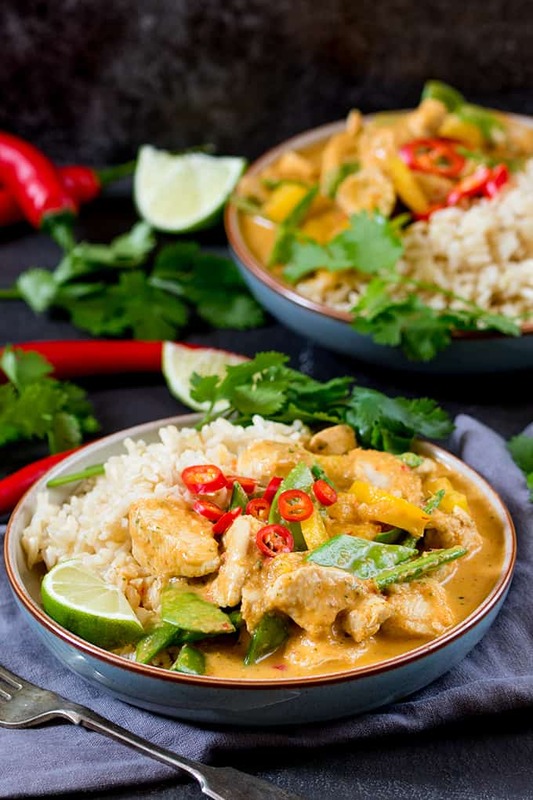 *Optional – if you would like the sauce to be a little thicker, mix 1 tbsp of cornflour with 2 tbsp cold water and stir into the sauce. 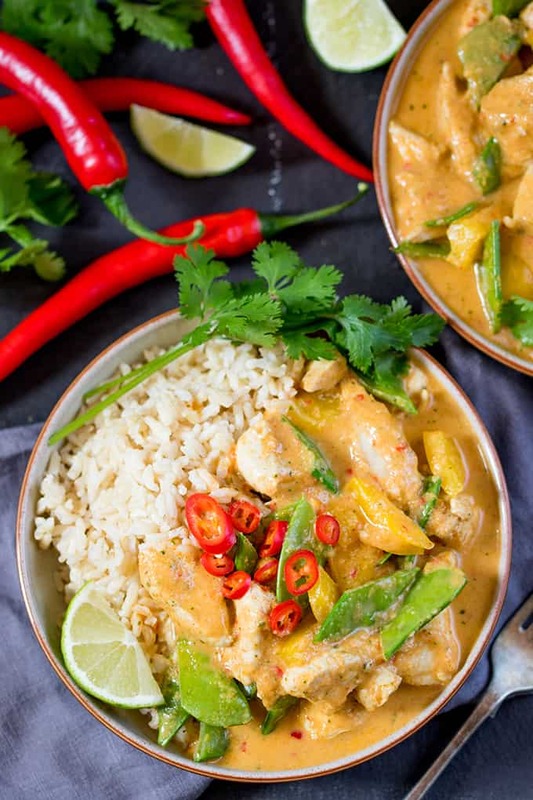 Serve the Thai curry with brown rice. Top with fresh coriander leaves and slices of red chilli. Nutritional information is per serving and does not include rice. Made this tonight, was a hit with my sons , one who has just returned from travelling round Thailand says it taste authentic! 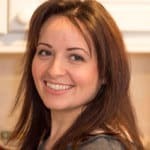 One for my recipe book, just discovered your blog and I am enjoying trying your recipes.